Literature written during a time of crisis allows us to glimpse the motivations and emotions that lay under the surface of activists. Kathleen Emerson was an Irishwoman in prison in London during 1912, when she wrote two poems about her experience. Read on for her story, and her poetry, which deserves to be more well known. The Irish Citizen, Saturday 25th May 1912. British Newspaper Archive. Leila de Cadiz and her sister Rosalind were not the only Irish women to travel to London in March 1912 to take part in the mass window-breaking demonstration organised by the Pankhurst's Women's Social and Political Union there. 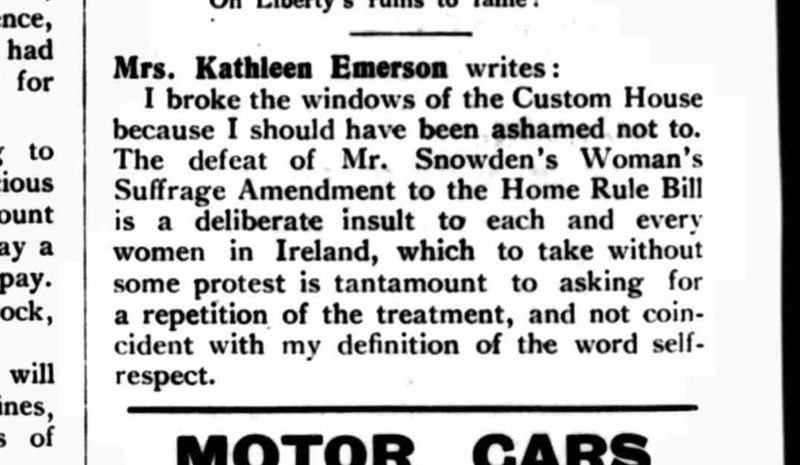 Another Irish suffrage activist who went to take part was Kathleen Emerson (née Holmes). She joined up to 200 women who were involved in smashing London's glass on the 1st and 4th of March that year. Kathleen was arrested and sentenced to two months' hard labour in Holloway. She served her time in the prison, also on hunger strike, at the same time as Leila was undergoing the horrific treatment of being forcibly-fed in the same building. While there, Kathleen wrote poetry which expressed something of her reaction to the experience. This example of prison poetry, written by a hunger-striking female political prisoner, has come down to us over a hundred years, and deserves to be more well-known. Is women’s free, unconquered will. The other poem by Kathleen to be included in the volume was called Oh! Who Are These In Scant Array, and described the people she encountered in the prison. It is much longer. A copy of the pamphlet 'Holloway Jingles' which went for auction recently. After the women were released, the poetry was collected and published by the Glasgow branch of the WSPU. The pamphlet was called Holloway Jingles; the title typical of deadpan suffragette humour. Copies of these pamphlets go for auction from time to time, for example here was one for sale, from which the image here is taken. The pamphlet was ribbon-bound in suffrage campaign colours of purple, green, and white. It was edited by Nancy John, fellow Holloway inmate, and of the Glasgow branch. It featured poems by women who would go on to be more well-known than our Kathleen, for example, Emily Wilding Davison. In March 1912 Kathleen Emerson, née Holmes, was a recent widow. Her husband George, who she had only married in 1910, had died suddenly in 1911. When the window smashing was taking place in London, it was just coming up to his first anniversary in April. Who knows how this would have affected her mood while incarcerated in Holloway as this sad and important event in her life passed? Kathleen's mother, Robina Holmes, was one of earliest members of the Irish Women's Franchise League, and in 1912, Kathleen herself was its assistant secretary. Her father had a good job with the railways, and the family probably moved around - in the 1901 census they were in Roscrea, and in 1911, they were in Dublin. Kathleen was living with them again at this stage, as a young widow. She threw herself into the suffrage campaign in Dublin. 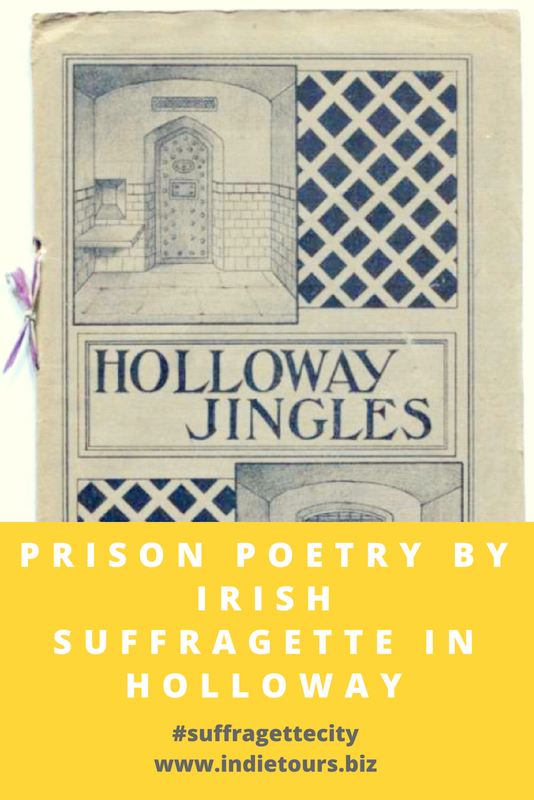 After returning from incarceration in Holloway in 1912, she took part in the militant suffrage activity in Dublin later that winter, breaking windows at the Custom House. The Irish Citizen, Saturday 16 November 1912. British Newspaper Archive. She would be in and out of prison for the next couple of years for similar reasons. After the beginning of the Great War, she spent more of her time writing literature, before marrying again in 1919, after which she ceased political activity. She died in 1970. I have found no photo or painting of Kathleen, but one very exciting image of her has emerged in this year's centenary commemorations. A privately-owned image was uncovered in a TCD library exhibition, and shows a young Kathleen in the dock in Green Street courthouse. She looks determined, angry, and weary of proceedings. Her impatience emanates. Kathleen Emerson and Margaret Connery in Green Street Dock, Dublin, 1912. Private Collection. Via 'Violence, Ridicule, and Silence' exhibition linked to below. Watkins, Sarah-Beth. Ireland's Suffragettes (The History Press, 2014). Maguire, Martin. 'Harry Nicholls and Kathleen Emerson: Protestant Rebels' in Studia Hibernica 35 (2008). Violence, Ridicule, and Silence - an (incredible!) online exhibition by Jane Maxwell of TCD. Find out as soon as #SuffragetteCity launches. The story of women such as Kathleen will be told in a series of seven stops around Dublin. Let’s not forget these women, their fight, or exactly where it all took place.